The U.S. Marine Mammal Commission flew to the Arctic for first time in almost 30 years to listen to Alaska’s coastal hunters talk about climate change and the health of seals, walrus and other marine mammals. But will what they heard translate into new policies and conservation efforts? NOME, USA – One of Austin Ahmasuk’s first memories is of sitting next to his grandfather on a walrus hunt. But much has changed since, he told a team from the U.S. Marine Mammal Commission (MMC) during a listening session in Nome, Alaska, earlier this month. “My grandfather probably would not understand some of the things that are occurring and I don’t know if he would have had the knowledge to reflect upon what kind of impacts we are experiencing as a result of climate change,” said Ahmasuk, who lives in Nome and still hunts walrus. Representatives of the MMC, an independent agency of the U.S. federal government, flew to Alaska for the first time since 1987 to hold listening sessions in indigenous communities to find out what impact climate change has on the Arctic marine environment and on subsistence hunting of marine mammals. Commissioner Daryl Boness said the visit is part of a strategic plan the agency developed two years ago to assess the impacts of climate change on marine mammals in northern Alaska. He said the group recognized they had been absent from the region for quite a while. “We have a small staff and we have to cover a lot of issues in the entire coastal country where there are marine mammals, so we’ll make up for lost time,” he said. The team visited Barrow, Kotzebue and Nome, and held a wrap-up meeting in Anchorage. 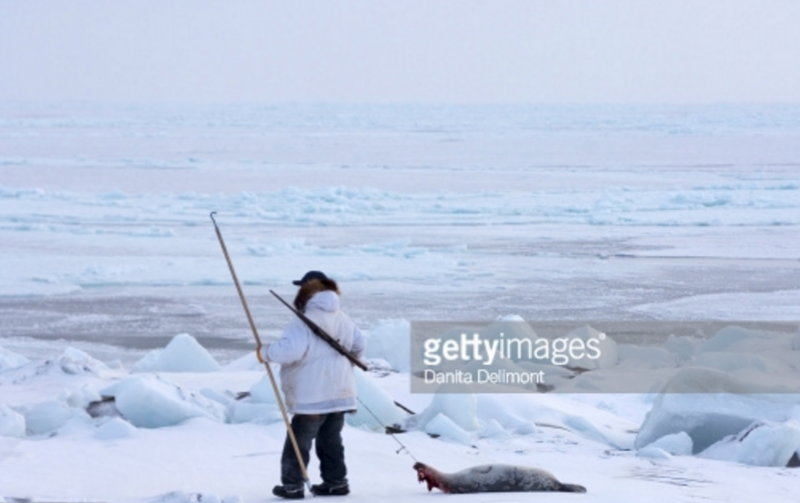 Participants in the sessions said they are seeing unstable sea ice, compressed hunting seasons and sick seals. They are also concerned about increased shipping traffic, and the possible listing of subsistence species, like Pacific walrus, as endangered species. They also told the Commission there’s a severe lack of communication between federal and state agencies and indigenous communities. Boness said it quickly became clear the MMC also needs to enhance communication efforts in the Arctic. “It’s always good to be – I won’t say ‘put in your place’ – but it’s always good to be told your weaknesses,” he said. In fact, most of the meeting’s participants had never heard of the agency. “It was voiced in our village meeting ‘Who is the MMC?’” said walrus hunter Clyde Oxereok. He was chosen by his tribal council in Wales, Alaska, as a representative in Nome, a Gold Rush-era town that lies on the southern coast of the Seward Peninsula. Oxereok’s was a sentiment repeated across northwest Alaska in the communities the group visited over the course of a week. Boness was surprised. “We came here with the mindset that they would see this [visit] in a very positive light,” said Boness. While they are not a regulatory agency, the MMC does make recommendations to the two federal agencies tasked with managing marine mammals in the U.S.: the National Marine Fisheries Service (NMFS) and the U.S. Fish and Wildlife Service (USFWS). Furthermore, the MMC also reports directly to the United States Congress – it can influence how money is allocated for research and they have a say in policy development. For example, the USFWS is currently moving through a process to list the Pacific walrus as an endangered species, a move that could have serious consequences for a region that relies heavily on the species as a subsistence food resource. Commissioners can use input from subsistence hunters to make recommendations during that process. The USFWS is legally obligated to respond to MMC recommendations in writing. “The best we can do is communicate [and] inform,” said Daryl Boness. In the past, the Commission’s recommendations have led to numerous federal permits for research as well as changes to interpretive language in federal laws like the Endangered Species Act. For example, in 2012 the MMC’s recommendations led to a permanent ban on nighttime gillnet fishing off the coast of North Carolina to reduce the impact on bottlenose dolphins. As for specific actions that will result from their Alaska visit, Boness said it’s too soon to tell, which didn’t sit well with Alaskans. “We’re tired of lip service – we’re dried out. That’s what we have been getting for 35 or 40 years,” Willy Goodwin told commissioners during the listening session in Anchorage. Goodwin, from Kotzebue, also serves as the chair of the Alaska Beluga Whale Committee and the chair of the Arctic Waterways Safety Committee. In response, Commissioner Frances Gulland said they were in Alaska to find a way to move beyond so-called “lip service.” She helped present a list of potential actionable items. The MMC identified several ways they might improve communication with Alaskan native communities, including the possibility of designating an MMC Alaska Native Liaison and to increase the number of visits the agency makes to the Arctic. Stories about run-ins with federal wildlife agents resonated most with Commissioner Michael Tillman. In the 1990s, federal wildlife agents went undercover to expose poaching and an illegal ivory trade in Alaska. Ever since, subsistence hunters have been nervous to talk about what and how they hunt. Tillman listened intently as hunters relayed stories about changing and unpredictable weather patterns and sea ice conditions, which have at times forced hunters to abandon the animals they have hunted. Because Alaska’s marine mammals are managed federally, hunters could be subject to hefty federal fines and time in federal prison if law enforcement believes they might have violated the law. Commissioners plan to recommend that federal agencies tasked with updating marine mammal regulations front-load their consultation efforts with northern communities early in the process. The MCC is also likely to recommend an increase in research funding. Top image: Walrus cows and yearlings resting on ice in Alaska.